A client I worked with recently had low back pain. As usual I had him lay down on the table and performed Thai massage on him. Having never had a massage before the client didn’t know what to expect, he just wanted help with his low back. As we went along the client commented on how much better it felt already. I explained to him briefly how tight muscles cause pain. If I have him curl a dumbell and hold it for ten minutes he’ll report that his arm hurts. Same thing holds for your back. If muscles contract or stretch and stay that way without relief, pain is the result. If we get them to relax, your nervous system sighs in relief. He told me he wished he could just stay this way. If he could only figure out how to remain like this he’d be fine. I told him he could, it’s called yoga. He said, “It’s better than this? Are you sure?” I laughed and explained to him that the very same things we’re doing together, he can do on his own. His advantage is that he can push himself right up to his edge, then breathe into it for a better stretch. The other is that he can take it with him wherever he goes. Once he’s learned yoga, he can use it whenever he wants. He would be a non-traditional student. I’d guess he’s in his 60’s and he’s concerned about his health as he ages. He’s not limber, flexible or young. He’s certainly not a south Austin 25 year old hipster. He is however a perfect candidate for yoga. He’s human and smart enough to listen to how his body feels. His body feels better after Thai massage and his body will respond just as well to yoga. If he’s smart enough to follow his instincts his chocolate just might fall into his peanut butter. Chocolate is Thai massage and yoga is peanut butter, they belong together. These healing traditions are for everyone. They can allow you to live a life you’ve only imagined. Older age doesn’t mean decay and suffering, it means older age. No judgements. If you work with your body your physical form is maintained and you can be more healthy and more vibrant than you were at 20. You’ll certainly have more wisdom. He asked me why no one had told him about this Thai massage or yoga before, he’s had back pain for 15 years. I told him no one is sticking a camera in my face to let me tell people. After finding a copy of Light on Yoga by BKS Iyengar he expressed great optimism about aging. Iyengar is in his 90’s and though mostly retired from teaching he has an active practice. My client having a model for old age and living well made him even more optimistic about his life. After all, he’s got another 30 years to explore what he’s just found. He recounted that he’s borderline diabetic but his blood sugar has stabilized. He’s not changed anything in his diet. When he asks me why I say, “no idea.” I smile and we continue exploring whatever it is we’re both doing that makes us feel so much better. This is the healing path. 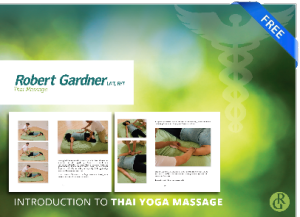 http://www.robertgardnerwellness.com/wp-content/uploads/2013/04/Robert-Gardner-Wellness-Thai-Massage-Header2.png 0 0 Robert Gardner http://www.robertgardnerwellness.com/wp-content/uploads/2013/04/Robert-Gardner-Wellness-Thai-Massage-Header2.png Robert Gardner2011-12-12 12:38:462011-12-12 12:38:46It's better than this?